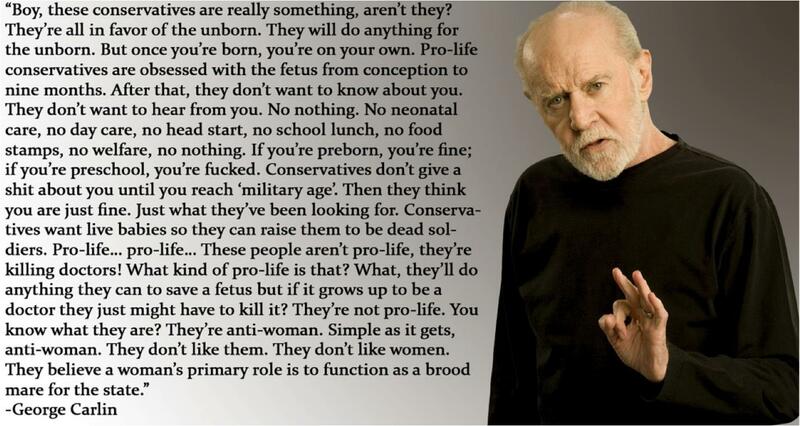 I can’t say it any better than George Carlin did. He’d have had a thing or two to say about the war on women. In fact, he pretty much covered it with this monologue. This Saturday, April 28, join a march or rally near you and protest the ongoing war on women’s reproductive rights and freedoms. Remember in November. You will be voting, won’t you? R.I.P. George. You were always my favorite. I love this gig of his. Honestly, not sure which one is my favorite as they all are. but this one really rings true to my beliefs. This one is so timely, it’s scary. I’ll bet he had no idea how much worse it was going to get. No, I’m sure he didn’t. I think he probably thought society would improve. Probably a good thing he’s not here now to witness the insanity. Although… he’d have a helluva lot of material to use. Especially this election.